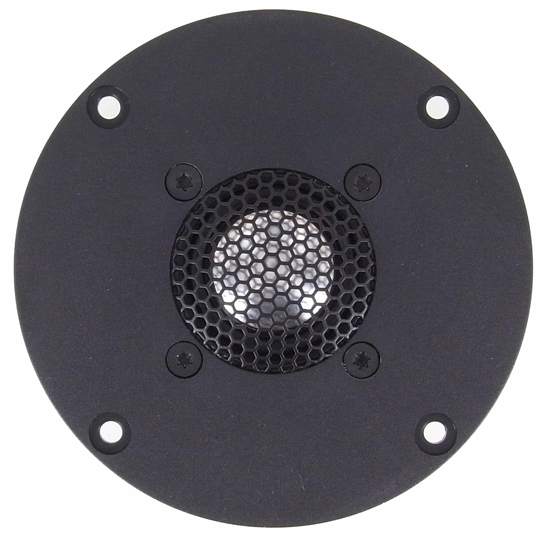 27TBFC/G is a High Definition metal dome tweeter with a wide, soft polymer surround and a rear chamber. Aluminium/magnesium alloy diaphragm with pistonic behaviour throughout the audible frequency range, resulting in a good dispersion also above 10kHz. A Hexagrid protects the diaphragm, and supports a phase plate which compensates for a slight axial roll off towards 20 kHz. Sonomax surround for low resonance and excellent mechanical linearity. Voice coil windings immersed in magnetic fluid increase short term power handling capacity and reduce the compression at high power levels. Stiff and stable rear chamber with optimal acoustic damping allows the tweeter to be used with moderately low crossover frequencies. Precision moulded chassis from glass fibre reinforced plastic, and its front design offers optimum radiation conditions. I purchased this driver to use in an active two way speaker system I recently built. I have been listening to Focal TC120's in an active, three way design for the past seven years, and their performance is absolutely astounding, and so my expectations re the performance of any tweeter are quite high. So it doesn't seem fair to be too hard in my review, since the Seas cost less than half that of the Focals. This driver has a lot of the right stuff, especially for an 8 inch two way system. Such a system requires that the tweeter be crossed as a very low frequency since nearly all 8 inch drivers start to come apart above 1000 cycles. Since this tweeter has such a low fs due to its rear chamber design, it can be crossed as low as 1500 and still function quite well. I am crossing it over at 2 khz with no problems, and I also played it through an alternate system crossed at 1.5 khz, and it still performed well. I am a fan of hard dome tweeters, and various metals seem to be the material of choice for designers in this school. The potential drawback to such materials involves potential harshness in the very upper range. My TC120's do not exhibit any of this, but my Focal TC 90's do indeed suffer this problem. These Seas tweeters do not have any of this harshness at all, even in an active design with the absence of passive crossover parts that might dampen that harshness down a bit, as is the case with my TC 90's. Having said that, these tweeters also do not come close to offering the level of upper range clarity that I am used to with the Focals, and that I was hoping for. In comparison to the Focals (and this comparison was done by swapping out just the tweeters, leaving everything else exactly the same, which one can do easily in an active system), these Seas tweeters sound like someone placed a cloth over the tweeters. Please don't misunderstand, in my very clean, active two way system that I built, the Seas performed very well, and most folks would likely be very happy with them. So the problem is due more to my expectations and demands than to these tweeters. They will be getting a new home in a future active, two way system I will be building in the coming months for my truck, and their protective screen will serve in this setting very well.